“Angry Lohan” Teo Choon Teck. Well if the truth must be told, I was nervy throughout the evening’s show and the seminar the day after. Unnerved not because of the VIPs seated in the front row, we had Penang Chief Minister’s assistant present, or the crowd but more because my Tai Chor (Grand Ancestor) teacher was there. How long have I known Ah Teck (GM Teo Choon Teck) now? 20 or 25 years maybe? To me, Ah Teck will always be Ah Teck; plain-spoken, in fact, letting his fists do the talking most of the times, he is never one to walk away from any challenges. That’s the attitude that has led him to turn out some of the best “Lui Tai” fighters in Asia for many years. The records speak for itself. Personally, he has been and still is the stern father figure that has kept his school running all these years, rain or shine. Whether it’s teaching you Tai Chor forms, iron vest training or sparring, he pushes all his students to the extreme. Sometimes I think, nothing is good enough for him when it comes to KF. He’s always raising the bar. His Sanchin test is to punch/kick you without reservations and if you are not standing after that punishment, you fail. Now at almost 70, he is still teaching and traveling; after Penang, he left for China for another annual gathering in Fukien. Maybe “retirement” is not in his vocabulary. When I approached him in Singapore to come to the event, he accepted without hesitation. And at 70, he still has the same effect on me – just like all those years ago when I was struggling to learn Tai Chor from him. To me and many of his other students, he will always be “Boss”. The Living Treasures of Penang. Cheong Cheng Loong – Chu Gar Phoenix Eyes Boxing. Wong Pak Chong – Chin Woo 7 Stars Praying Mantis. Ong Choon Sheng – Fukien Grand Ancestor Boxing. Cheong Hon Heon – Geok Gar Kuen. And how appropriate – living treasures indeed! All these gentlemen had committed a major portion of their lives to the mastering and transmission of the arts; staunchly keeping to the ways they were taught. A link in a historical chain that reaches back hundreds of year of Chinese histories and with no sight of slowing down. These are folks who are well above 60 years of age and still, on any given day, run circles around much younger exponents. I was on the receiving end of many of their superb skills. To be able to “rise and sit” with these illustrious masters is a privilege and honor; one that I do not take lightly. Calvin Kong in a “Shaolin Lohan” posture. Foo Ming – Shaolin monkey boxing. Well it’s like how I announced them that day on stage; “With personal pride and pleasure…….”. 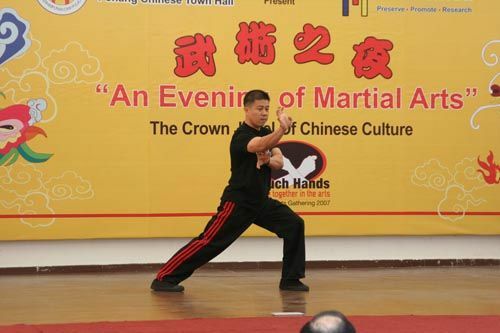 “Chinese Martial Art Assocation” from Kuching Sarawak, founded by GM Lew Kao Chye some 20 – 30 years ago. Initially teaching “Chu Gar Fu Zhuang Sam Bu Chien” or “Hakka Chu Gar Tiger Boxing”, this CKF association have been through quite a bit of trials and tribulations in recent years. Currently under the helm of Chester Lim, this association has ventured in competition Wushu and help produced many current champions of this country. Comprising primarily of schools-going kids, 2 of the more seniors and acting as “coaches” are Calvin Kong and Yap Foo Ming. And with their diversified interest that also includes traditional CKF, I have been personally teaching some of the more senior athletes some of the skills that I’ve picked up in my time. Zhou Jia, Tai Zu , Shaolin (SaoLim) and Fuzhou White Crane, I am hoping to plant some of the seeds here in Sarawak with this group of fine athletes. In this Penang event, they won accolades, not only from the audiences and peers but even from the veteran masters with their impressive showing of modern and traditional Wushu. Yip Kin Wing Chun’s proud son – Sifu Tony Yap. Another young Sifu who appeared in this event – Sifu Tony Yap of Kuala Lumpur. Largely seen as the successor of GM Yip Fook Choy, the current custodian of Yip Kin WCK in Malaysia, Tony is a very forward-looking young teacher. Not at liberty to disclose his profession except that it requires real fighting skills, Tony is very much focused on the “combat” aspect of TCMA; this was clearly his presentation during the workshop held. The few occasions that I had talking to him, he came across as someone who is dead serious about the preservation of his chosen style of CKF. And just like Ku Sifu, he is working hard to re-unite all the WCKs in Nanyang. This Penang trip for him and his group of KF brothers, and they drove from KL to Penang in a SUV, was firstly to showcase their particular stream of WCK. Secondly, I suspect, it’s all about sitting down to have dinner with Ku Sifu and Por Suk. Again I want to say that this first-time collaboration with Tony is just but the beginning of another journey …..